With little Baby Boy on the way I have been thinking a lot about what his nursery is going to look like. I don't know why deciding on colors that aren't girly, but still appeal to me have been so hard! Seriously! I don't think I was cut out to be a mom to a boy! Finally, I decided on doing mustard yellow, gray, and black. Luckily for me, the nursery is already painted gray, so I am one step closer than I was before to getting his room done. Thankfully, I still have 3 more months to get prepared for this little bundle of joy. 1. Cut a board down to the desired size. 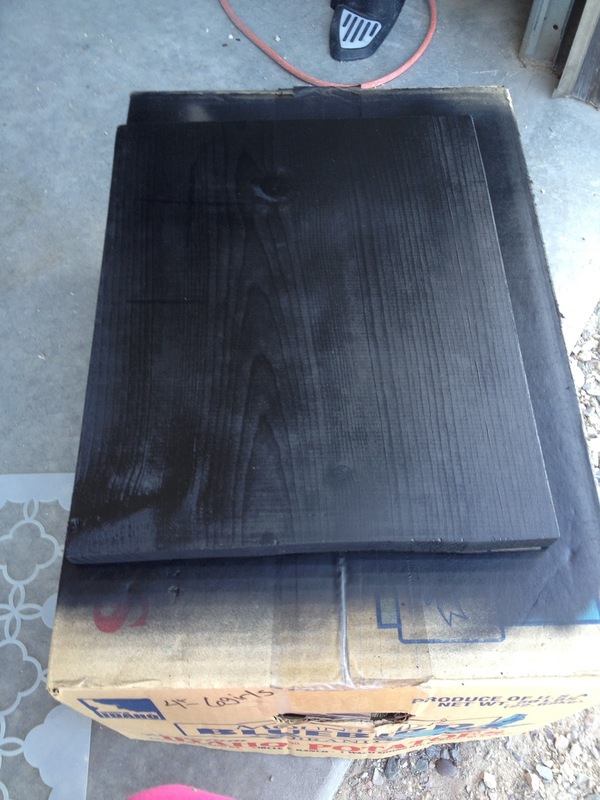 My vinyl piece measured 12 inches long so I cut my board 14 inches long. 3. 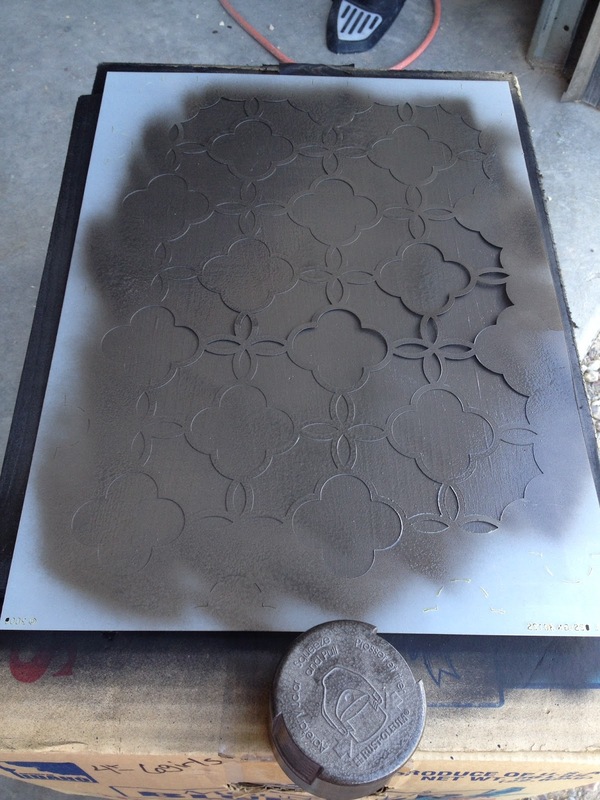 After that has dried take the stencil that you would like the pattern of and lay it on top of your board. My stencil was a little smaller than my board so I had to move the stencil around and paint it several times. I would suggest NOT spray painting it like I did. I centered the stencil on my board and sprayed it first and then I had to lay the stencil down 4 different times in each corner to finish the entire board off. Next time, I would start in 1 corner and spray the stencil and then move it to the other corners, making sure to line up the stencil each time. 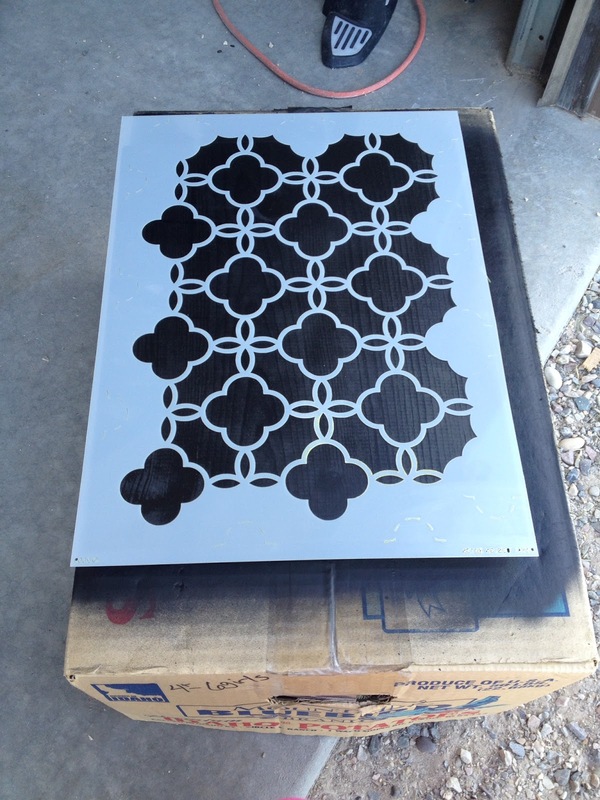 It would lessen the amount of times you would have to move the stencil and spray. Also, you will either need to be REALLY quick when you are repositioning and spraying each time, OR wait after each spray for the paint to no longer be tacky. Otherwise, the paint will stick to your stencil when you move it. I am not very patient so I tried to be as quick as I could which worked for the most part, but not completely. One other note. 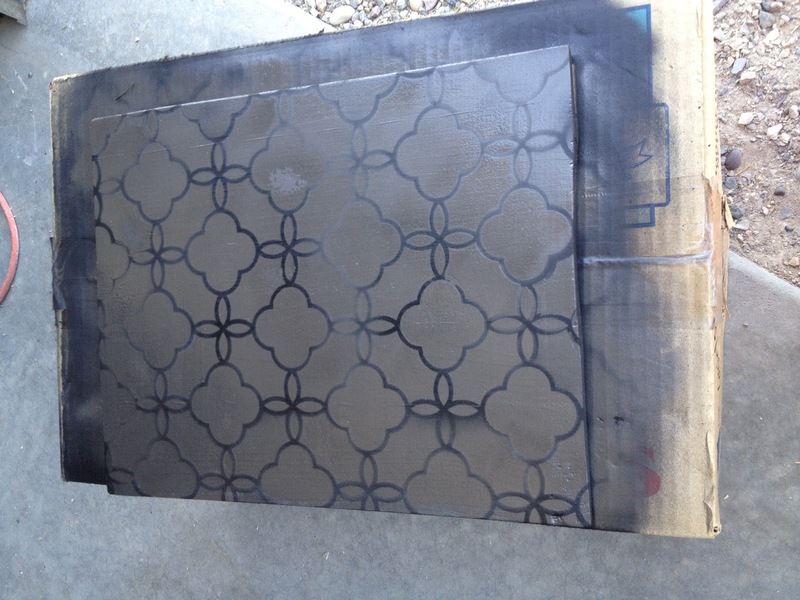 I didn't want my stenciling to be perfect and clean. I wanted a little rustic, not perfect look to it. 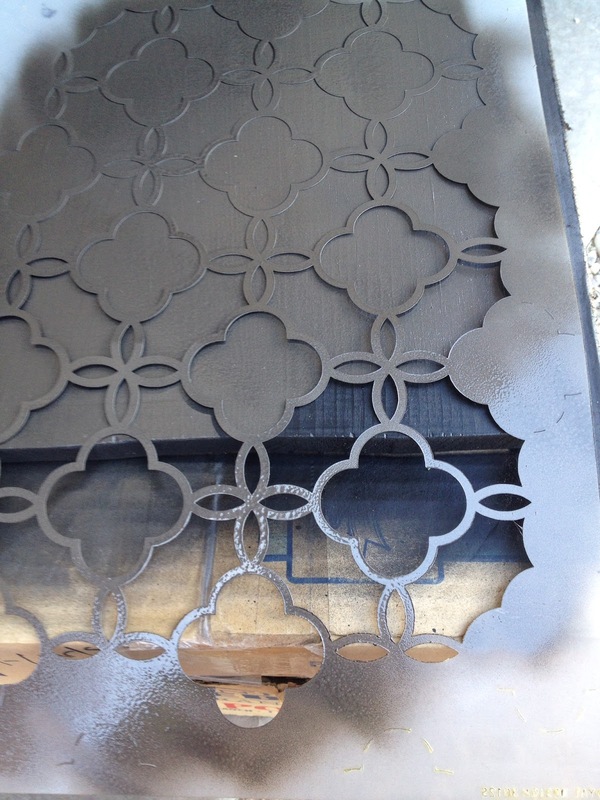 IF I wanted the stenciling to be perfect, I would have been A LOT more careful in the stenciling. 4. Now take your vinyl letter and put it onto your board. 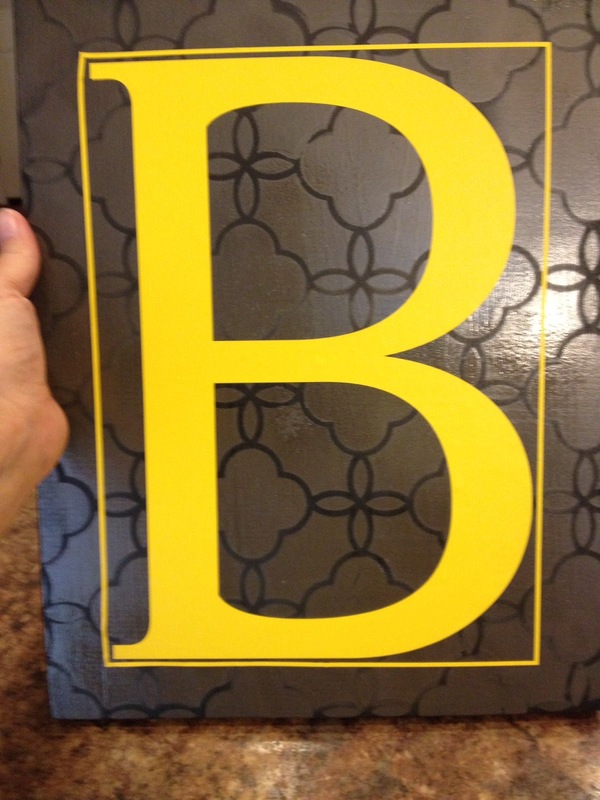 I used the the Classic Letters Monogram Vinyl Wall Decal from Wallternatives. 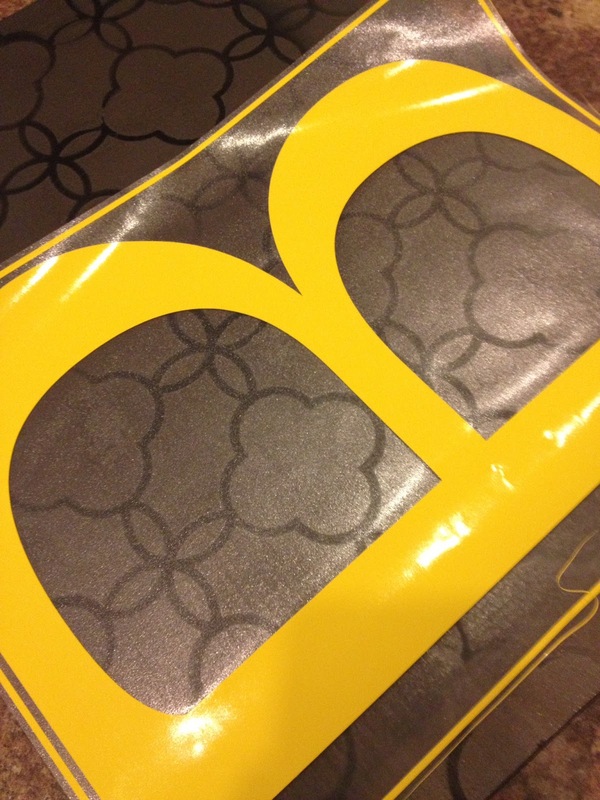 They not only have the letters, but they have a ton of amazing different vinyl and fabric decals for your home. Seriously, head on over and check their website out. It is amazing! I especially love all of their designs in Chalkboard Vinyl. 5. You are finished! Isn't it cute! So cute! I'm going to try this! I love DIY's. This is a great idea and it looks so professional. You did such a beautiful job on this. I want to get all crafty and make one of these myself. Wow that is impressive. The project came out really great. The yellow really pops with the gray background. That's a cool project. I'll have to show this to my wife...we may be tackling it soon. Thanks. Such a fun project and I love the way you layered the stencil and the Wallternatives letter! Yes...it turned out very cute. And don't fret about being mom to a boy...you'll do great. It's all instinctual and you'll rock it! 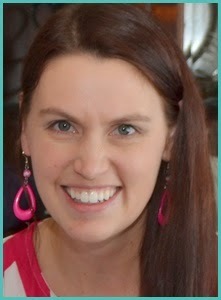 I love this and it looks so easy too! I also love that the yellow is so bright and cheerful. I love stenciled wall art. We had some done for my daughters room at home and her dorm room. I love your color choices. This looks so cute and it was relatively easy to make. Thank you for sharing. Gorgeous! 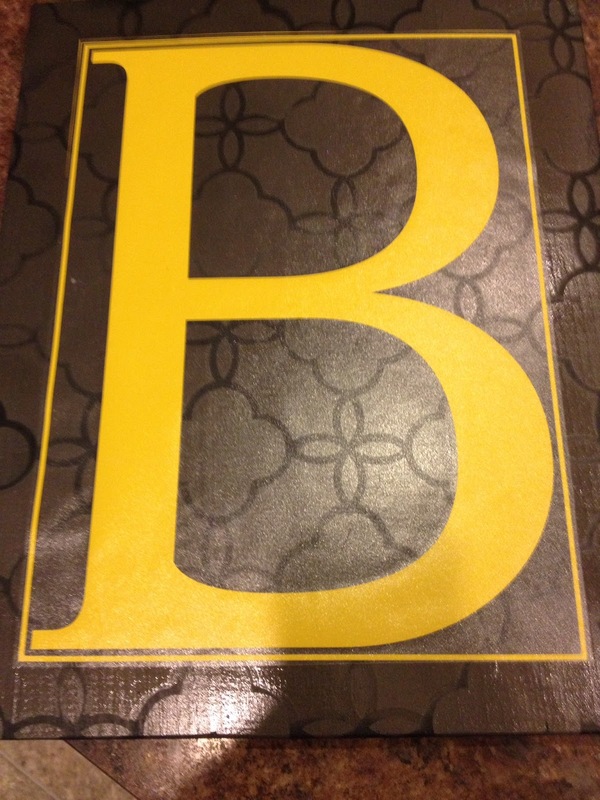 I really love that pattern underneath the B too! Love the B. My son's name is Brayden so it's perfect. I wish I had more time for DIY projects.